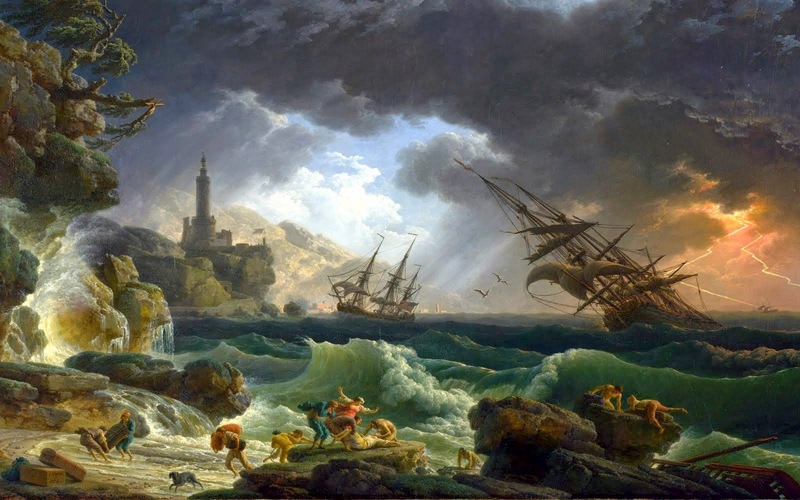 This post will be centred around works of art that complement or contrast my selected painting of focus, Pierre-Jacques Volaire's the Eruption of Mt. Vesuvius (pictured below). 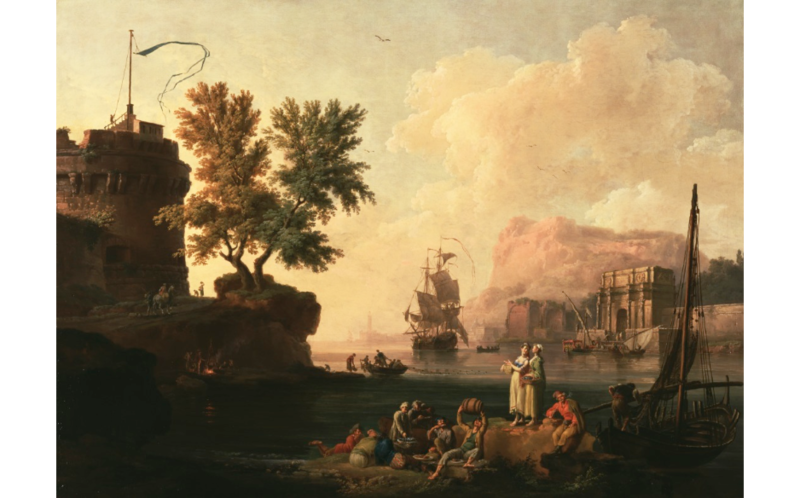 This painting shows a peaceful scene at a Mediterranean Harbor. The people washing clothes in the forefront, the fisherman toward the background, and the big ship at the very back play into a very coastal setting. The architecture seen at either edge of the picture seems to be surrounded with vegetation and very Romanesque. The setting must either be dusk or early morning as we see shadows and the sun illuminating the background. This ties in to my selected painting as we see the interplay between tranquil nature and normal people. This painting ties a bit more into the painting I selected. Here we see people fleeing from the oceanside in an attempts to escape the brutal waves hitting the coast as well as the massive storm ensuing in the sea. Though we see two ships being tossed around in the water, the background to the left shows a bit more light and hope of peace than what is seen to be going on in the background to the right and the forefront. This of course ties into my picture as it shows the utter chaos nature can sometimes instill into what is typically a very peaceful setting. This painting is another famous Vesuvius painting from my selected painting’s artist, Volaire. Much like the one I selected, this painting shows the eruption of Mt. 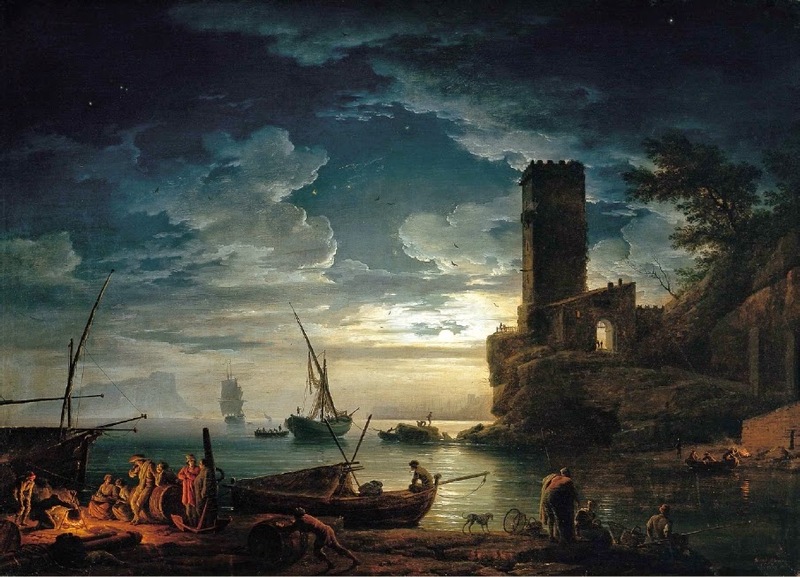 Vesuvius in the left portion of the painting while showcasing a cloudy night scene lit by the moon over very still waters. The smoke perfusing out of the volcano seems to mix with the pallet of the night scene, while the bright orange and red scene from the magma pouring over the land perfectly contrasts the chill blue on the opposite side of the painting. People are seen watching the eruption occur, just gazing at the magnificence of it all. This is a very tranquil peace showcasing the countryside of western Europe. Lush vegetation circles around a dirt road and goes up to meet with the cloudy yet clearly bright skies. The vegetation to the right of the picture is sparse and loose, and we can see what seems to be a lake at the very edge; this portion of the picture is much brighter. Toward the left of the picture, trees and bushes are tightly packed, creating shadows and shrouds of mystery which leads us wondering where the dirt road leads to. The people in the painting exhibit a calm demeanor, much like the nature itself. This relates to my selected painting as it shows the serenity of nature clouded with mystery. Another painting by Vernet exhibiting his great use of lighting and nightscapes, this painting is yet again of a very tranquil setting. This most certainly seems to be dusk over a fishing-centred town in the Mediterranean as fisherman return back to the harbor to unload their day’s work. The fireplace in the foreground to the right provides excellent contrast to the otherwise starry and lucid sky, with the setting sun in the very background bouncing off the water and giving some lasting light to the painting. 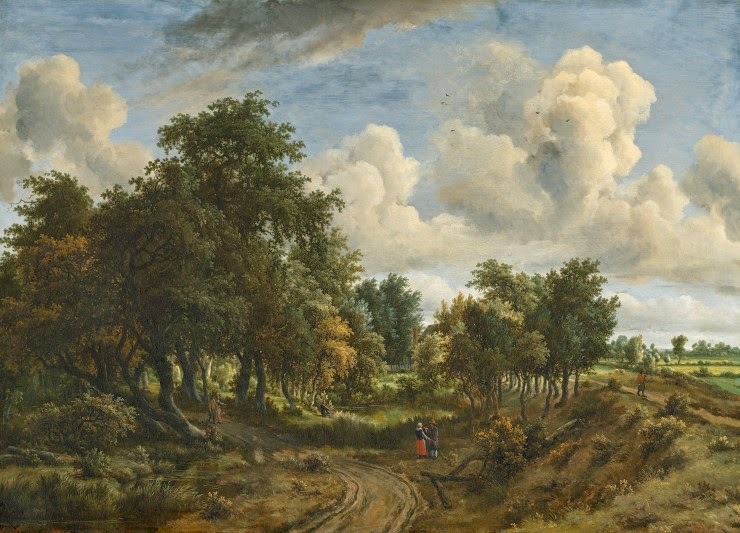 The painting shows a very peaceful side of nature, one we would be used to on a daily basis.